When it comes to wear and tear, the knee is the joint most often affected by osteoarthritis, closely followed by the hip. Every year, GPs diagnose an astonishing 20,000 new cases of osteoarthritis of the hip joint. 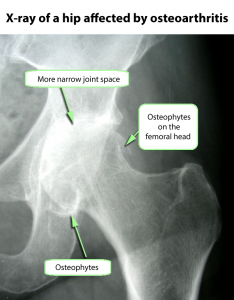 Osteoarthritis of the hip – which physicians prefer to call ‘coxarthrosis’ – mainly occurs in people aged 55 or older. Moreover, women are twice as likely as men to suffer from hip arthritis. The hip joint is a ball joint that is made up of two parts. The round femoral head fits exactly into the hip socket, allowing this flexible joint to effortlessly move in all directions. Therefore, you can stretch your leg, bend it and move it sideways, both inward and outward, without putting too much strain on the hip joint. The hip socket and femoral head are covered with a thick layer of cartilage, which absorbs shocks and ensures that the two ends of the bones of the hip joint can easily slide over one another. It is therefore not surprising that this joint is so sensitive to wear and tear. After all, when you take a 5-kilometre walk, the hip joint is loaded with the equivalent of a weight of 300 kg, about 10,000 times. Yet this poses no problems as long as the muscles, the cartilage and the joint capsule are healthy. 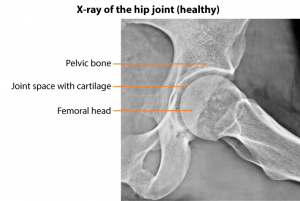 What causes arthritis of the hip? It is not known what exactly causes hip osteoarthritis, but as we get older, the quality of our cartilage may decrease. Osteoarthritis is nothing more than a natural wear-and-tear process, but congenital anomalies, inflammation and damage caused by injuries can also result in arthritis. People whose job requires them to bear a heavy load on their hip joints, as well as overweight persons, are more susceptible to osteoarthritis of the hip – or ‘coxarthrosis’. What are the consequences of arthritis of the hip? When osteoarthritis affects the hip joints, the surrounding cartilage starts to deteriorate. As a result, the two bone endings no longer slide over one another smoothly. Moreover, shocks due to movement are not absorbed as effectively as before. If, eventually, the cartilage disappears completely, the rough bone endings slide over each other, causing increased pressure. The body then reacts by forming osteophytes, abnormal bone growths along the edges of the hip joint, widening the latter and distributing the pressure across a larger surface. This is the body’s way of trying to limit the consequences of arthritis. What are the symptoms of arthritis of the hip? One of the main symptoms of hip osteoarthritis is groin pain, which often also radiates to the buttocks, thigh and knee. ‘Start-up pain’ is also quite common. This pain and stiffness occurs when patients get out of bed or get up from a sitting position. As the cartilage continues to thin, it becomes increasingly difficult and painful to move the hip joint. Daily tasks, such as tying shoe laces, walking up and down stairs, and getting into a car, become more and more of an issue. Moreover, the hip joints may become inflamed. Excessive wear and tear can even make the leg turn outward due to shortening of the joint capsules, ligaments and muscles surrounding the hip joint. How is osteoarthritis of the hip diagnosed? Generally, physicians can diagnose arthritis of the hip by asking specific questions and through a physical examination. An X-ray of the hip is only taken if there are doubts on the diagnosis or if surgery is being considered. Worn cartilage is clearly visible on an X-ray, because it makes the joint space appear narrower than it should be. If any osteophytes have formed, they can also be seen on the X-ray. How is arthritis of the hip treated? Once the cartilage has been damaged, it cannot be repaired. Therefore, any treatment is aimed solely at reducing joint pain and stiffness. 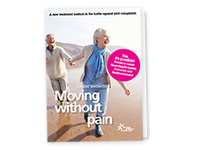 Usually, the GP will refer patients to a physiotherapist, who will teach them how to move without putting excessive pressure on the hip joint. Physicians can also prescribe anti-inflammatories to ease the pain. Bear in mind though, that many patients report nasty side effects when using this medication. 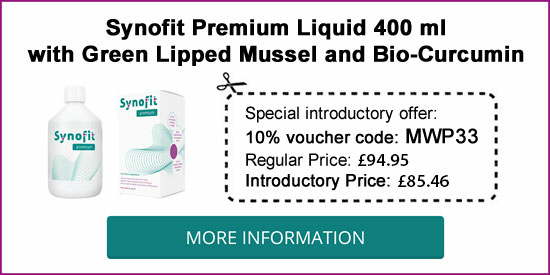 The good news is that there is a natural alternative based on a liquid combination of Green-lipped mussel and Curcumin. This natural anti-inflammatory eases the pain without the nasty side effects of non-steroidal anti-inflammatory drugs (NSAIDs). It is sold at pharmacies, drugstores and health shops without prescription. If the pain worsens, the hip socket or femoral head can be replaced surgically. In case of excessive wear and tear, the entire joint can also be replaced with an artificial one. Below you will find an exercise programme that aims to promote hip mobility. You should do three sets of each exercise, with a 30-second break after each set. Good luck! Lie on our back, bending one leg and keeping your foot flat on the ground. Keep the other leg stretched across the floor. Move the stretched leg outward across the floor, count to three and move it back to the starting position. Repeat with your other leg. Lie on your back, with your legs pulled up and your feet flat on the ground. Spread your legs outward, keeping your feet joined together. Count to eight and release. Stand upright. Place one leg in front of you and one behind. Push the hip of the back leg forward. Repeat with the other leg. Lie on your back, with your legs pulled up and your feet flat on the ground. Tilt your pelvis forward, creating a bridge. Align your torso with your thighs and return to the starting position. Stand upright, keeping your feet slightly apart, right under your hips. Bend your knees while moving your buttocks backwards. Make sure your knees do not move past your toes.